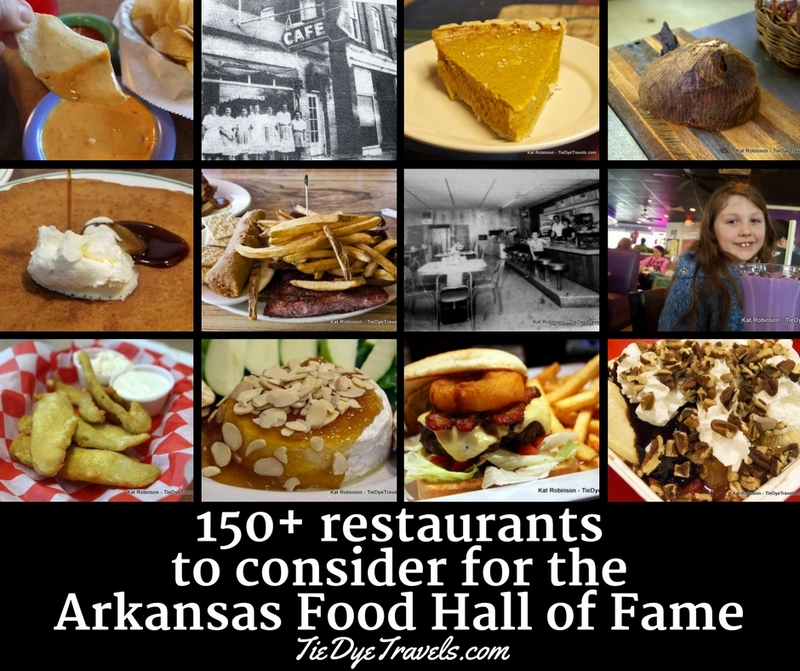 150+ Restaurants to Consider for Induction Into Arkansas's Food Hall of Fame. Note: Save this for reference for voting in next year's Arkansas Food Hall of Fame! I've been asked who I'd vote for on this year's nominating ballot for Arkansas Food Hall of Fame. 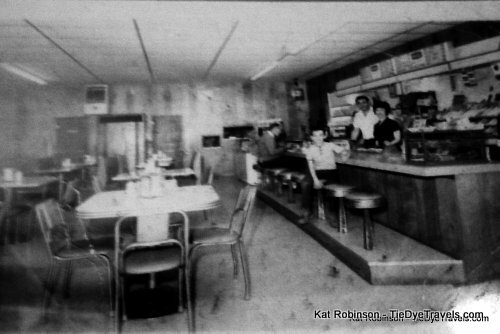 I can't tell you that, but I can share some of the really cool stories I've written on Arkansas's classic restaurants. Hold on folks, this'll be a long one. 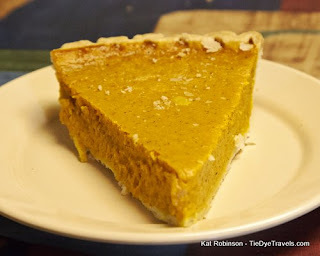 As you know from reading Tie Dye Travels, I've been covering the state of Arkansas for ten years now as a food journalist, writing about food, restaurants and the dining experience in addition to the travel, stories of interest and other tidbits I share with you. 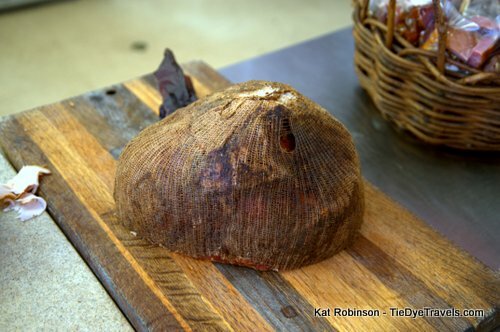 I have a unique and growing insight into Arkansas food and the places where you can enjoy it. When it comes to selecting classic restaurants for inclusion in this year's Arkansas Food Hall of Fame, it's up to you to do the nominating. This piece showcases a whole lot of fantastic restaurants that deserve your attention. Scroll on through to see these options - and click through for stories I've written about each one. Last year's inaugural class: Jones' Barbecue Diner in Marianna, Lassis Inn in Little Rock, Rhoda's Famous Hot Tamales and Pies in Lake Village. White House Cafe in Camden. The oldest restaurant in the state: White House Cafe. This Camden mainstay in its almost triangular two story building once stood alongside the railroad tracks. It's been offering plenty of good things to eat since 1907, and still sports an unusual one-of-a-kind bar in its front room. The second oldest restaurant in the state: Ozark Cafe. 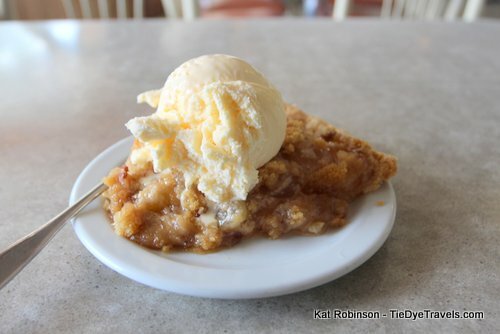 In Jasper, this old fashioned soda fountain and family restaurant sits right on the square, offering views of memorabilia from all the years since its opening in 1909. If that wasn't enough, the restaurant's unusual selection of burgers certainly takes the cake. The Ohio Club in Hot Springs. The oldest bar in Arkansas: The Ohio Club. The Hot Springs speakeasy has served booze since it opened but added food along the way, and offers some of the best burgers in the city today. 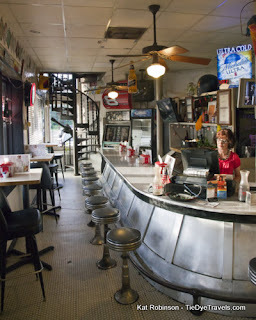 The oldest cafeteria in Arkansas: Franke's Cafeteria. Though long removed from its original spot downtown where it operated as a bakery in 1919. the four-generation Franke family ownership of this dual-location cafeteria has remained steady over the years. 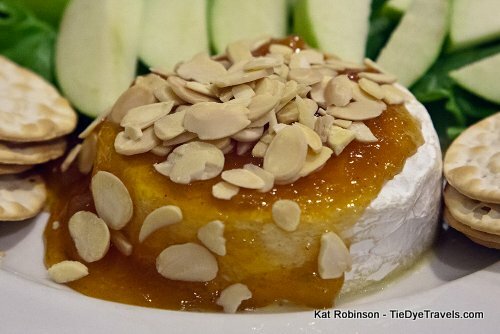 Here's where you'll find congealed salads, cinnamon cream pie and the famous eggplant casserole. And then there's the oldest restaurant building still being used as a restaurant - that'd be the 19th century Williams Tavern Restaurant at Historic Washington State Park near Hope. 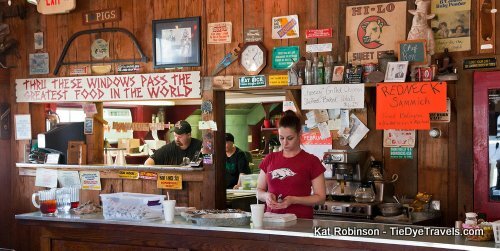 Central Arkansas's oldest barbecue joint: The White Pig Inn. I demur to my friend Rex Nelson on this one, since he even uses the image of the pig sign out front as his blog's logo. Steady service along the highway in North Little Rock since 1920. The article also talks much about Blytheville's famed barbecue joints, including Yank's and Penn's and Dixie Pig. Oldest restaurant in the Ouachitas: Skyline Cafe in Mena, which dates back to 1922, is still in operation despite a tornado-induced hiatus. Mexico Chiquito in Little Rock. 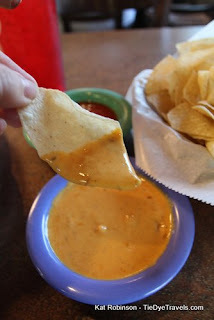 The original cheese dip comes from Mexico Chiquito, where the Donnelly's started selling an emulsion of cheese and spices served with tortilla chips in the 1930s. 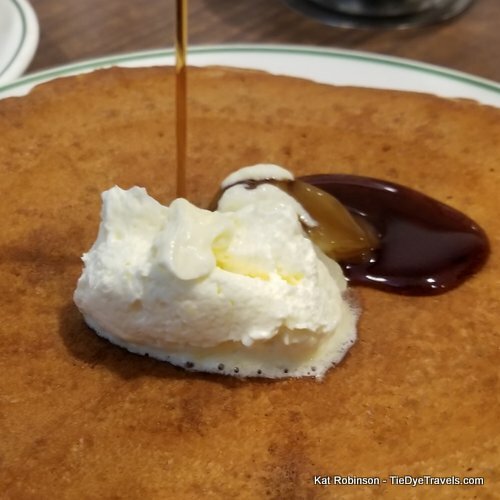 There's the extraordinarily unchanging breakfast favorite, The Pancake Shop, in Hot Springs. The Pancake Shop in Hot Springs. The Old South in Russellville. There's also the last outpost of a once strong chain started in Fort Smith. The Old South location in Russellville was actually the second in the franchise, opened in 1947 - and it ran continuously 24 hours a day through the 20th century. It's recently received new life and interest. Arkansas's famed diners include more than just The Old South but also Neal's Cafe in Springdale, Benson's Grill in Fort Smith and Frontier Diner in Little Rock. 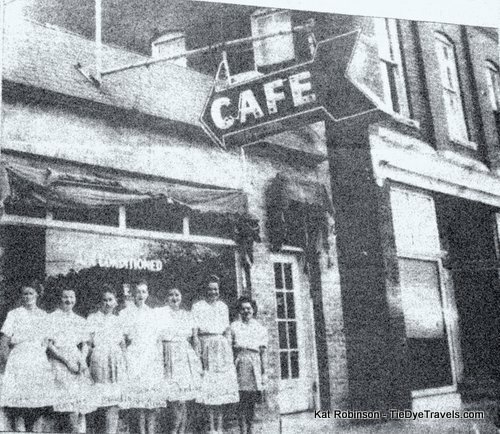 Rock Cafe in Waldron has served its small community well all the way back to 1936. There are also the great home cooking places like Eunice's in Fort Smith and both Dave and Ray's Downtown Diner and Bobby's Country Cookin' in Little Rock. The Venesian Inn in Tontitown. Fried chicken and spaghetti, the dish of the Arkansas Ozarks, has long been appreciated from the venerable Venesian Inn in Tontitown. Nearby purveyor Mama Z's also qualifies (and now-gone Mary Maestri's should be considered for Gone But Not Forgotten). The quite well known AQ Chicken House in Springdale also serves the pairing. 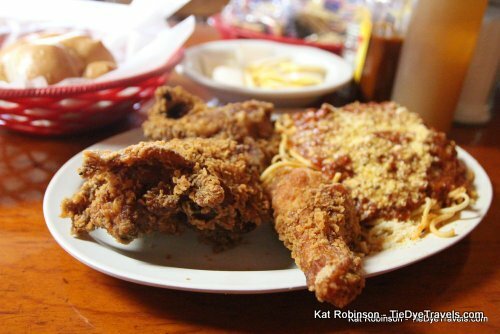 And without the spaghetti, you really can't complete the fried chicken conversation without a mention of the family-style service at the Monte Ne Inn Chicken Restaurant. Burge's in the Heights in Little Rock. 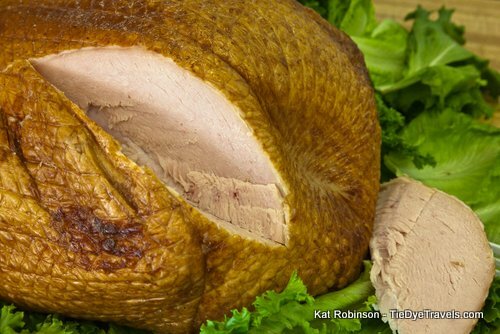 Smoked meats have always been a part of Arkansas cuisine, and you'll find smoked turkey of some great renown at Burge's in the Heights and Burge's in Lewisville. Coursey's Smoked Meats still has ham, turkey and smoked sausages for you to take home - and snack bags to take home. The Meat Shoppe in Gravel Ridge has Italian Roast and pork loin, too. Coursey's Smoked Meats at St. Joe. For Italian, you can drive the state and find so many good pastas, from Ermilio's and Katherine's Cafe Amore in Eureka Springs to Uncle John's in Crawfordsville, Taliano's in Fort Smith and Belle Arti in Hot Springs, Bruno's Little Italy and Ciao's in Little Rock and even my own sentimental favorite of Lazzari Italian Oven in Jonesboro. For pizza, there's Steffey's Pizza in Lavaca, Rod's Pizza Cellar and Rocky's Corner in Hot Springs, Tommy's Famous A Pizzeria in Mountain View, Iriana's and Vino's and U.S. Pizza Company in Little Rock. Prefer more exotic fare? Star of India in Little Rock is always deserving of your attention. 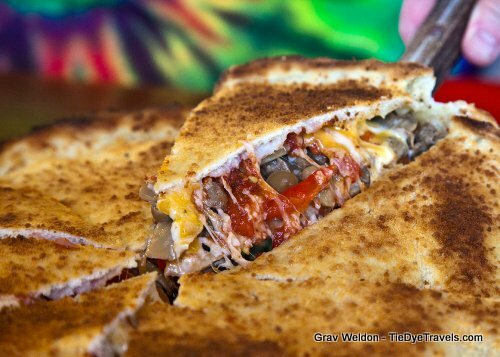 There's good classic gyros and such offered from the former gas station where Leo's Greek Castle lives, and the food truck turned brick-and-mortar classoc of Paizi's Gyros in Fort Smith. Fred's Hickory Inn in Bentonville. 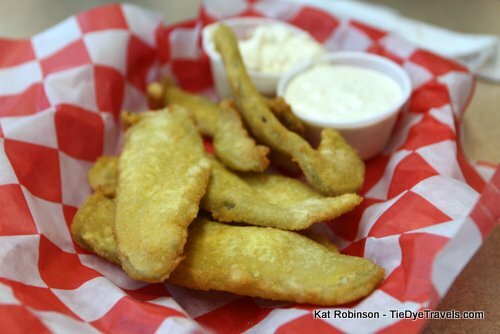 Fred's Hickory Inn, Sam Walton's favorite eatery, deserves a revisit. I stopped in back in January and was delighted with both the new ownership and the classic smoked sirloin. Trio's in Little Rock, one of the first out-west restaurants, is still around and offering ever-evolving menu items to satisfy an ever-changing regional palate. DeVito's two locations are quite different, but both sell Italian food and fresh trout - whether it's the fine dining establishment on Center Street in Eureka Springs or the right-by-the-creek fish-for-your-supper family restaurant at Bear Creek Springs near Harrison. Marshall's half-century-old Daisy Queen is still adding to its plethora of menu boards and is still packed on the US 65 drive. Presley's Drive In of Jonesboro and Big John's Shake Shack of Marion both deserve recognition as marvelous, innovative and delicious Upper Delta dairy bars. In northwest Arkansas, Patrick's Burgers and the Susie Q Malt Shop are equally awesome. There's also the iconic Mammoth Orange Cafe in Redfield, Salem Dairy Bar near Benton and the Dairyette in Mt. Ida, and Atkinson's Blue Diamond Cafe in Morrilton. 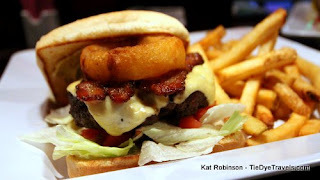 In fact, Arkansas certainly loves its burgers. From The Box and Black Angus to Midtown Billiards and Cotham's in the City in Little Rock to the Bulldog in Bald Knob (also known for its famed strawberry shortcake), Wink's Malt Stand in North Little Rock, Tidwell's Dairy Bar in Lonoke, Top Rock Drive In in Alpena, Hamburger Station in Paragould, Dairy Shack in Waldenburg, Back Forty in Mountain Home, Morrilton Drive-In in Morrilton, the Town Pump with its eponymous burger complete with black olives, fat burgers with chips at EJ's Eats and Drinks, the lone delicious but different Mountainburger from the Dairy Dream in Mountainburg, all the way to the largest burgers in Arkansas at Ed Walker's in Fort Smith. And of course, we like a good steak, whether it's from Colonial Steakhouse in Pine Bluff or Taylor's Grocery near Dumas. Of course, catfish is a firm part of our culture, and few places serve it as well as Alma's Catfish Hole or Murry's Restaurant near Hazen. There's also Gene's Barbecue in Brinkley, Woods Place in Camden and Nick's BBQ and Catfish in Carlisle. And then there are tamales - Arkansas Delta style - originating with the line that's come to Pasquale's Tamales in Helena-West Helena and including the famous Lackey's chicken tamales at Smokehouse Barbecue in Newport and the renown ones at Little Rock's Doe's Eat Place - which earns a place as a true Arkansas classic thanks to its strong ties to Arkansas political history. 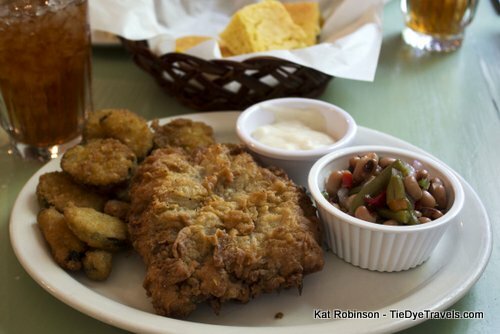 For Cajun fare, there's Cajun's Wharf in Little Rock and Who Dat's? in Bald Knob. 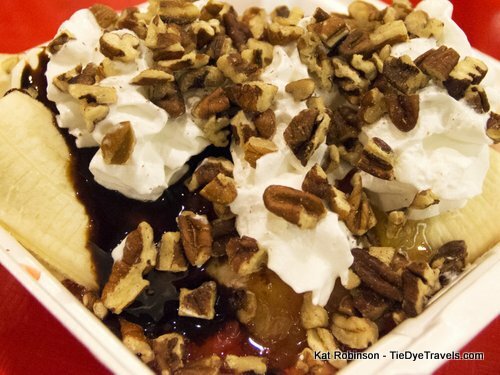 Spradlin's Dairy Delight purports itself to be the birthplace of the Frito chili pie. 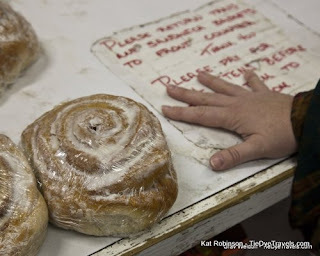 The largest cinnamon rolls in the state can be found at Burl's Country Smokehouse at Royal. The largest biscuits come from Meacham's Family Restaurant in Ash Flat. And Frank's Hickory House in Choctaw challenges all with the Dang Revenooer. Celebrate neighborhood favorites. 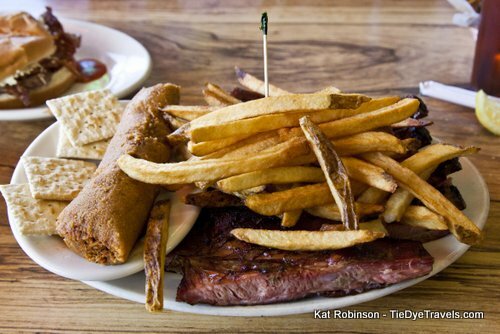 In Little Rock, Terri-Lynn's BBQ and Deli certainly qualifies, as does Cheers in the Heights, Buffalo Grill, The Faded Rose, Jimmy's Serious Sandwiches and Alley-Oops and, over in North Little Rock, Gadwall's Grill. Dondie's White River Princess in Des Arc. Local Flavor Cafe in Eureka Springs. 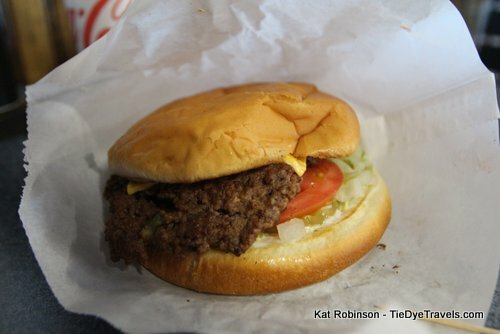 College towns love their favorites, too - whether it's Stoby's in Conway and Russellville, Feltner's Whatta-Burger in Russellville or Herman's Ribhouse and Hugo's in Fayetteville. The Hamburger Barn in Arkadelphia might qualify here, as might Susan's Restaurant in Springdale, which sees its own influx around time for Razorback football. There are plenty of Tex-Mex and Ark-Mex and Mexican joints that have served the passage of time, from Taco Villa in Russellville to Taco Pronto in Hot Springs, the Oasis in Eureka Springs, Pancho's Mexican Restaurant in West Memphis, Glasgow's Restaurant in Bentonville and three locations of Casa Manana in Little Rock. 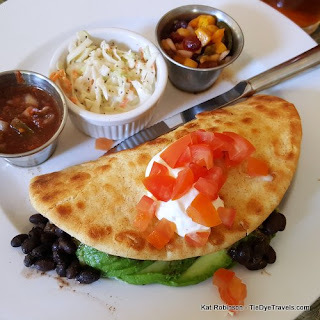 A few German restaurants carry on that part of our heritage - such as Emmy's German Restaurant in Fort Smith and Bavarian Inn in Eureka Springs. I love country stores that serve good food - like Molly's Diner in Warren and the Ole Sawmill Cafe in Forrest City and the extraordinary long buffets of Brown's Country Store and Restaurant in Benton. I love to see an entire town's history splayed on the wall like you see at Calico County in Fort Smith. I also love to dine in eclectic places such as in a grocery store in Malvern at Keeney's, inside an old post office in Jonesboro at Sue's Kitchen, in an old cattle barn at The Cow Pen in Lake Village, at the top of War Eagle Mill at the Bean Palace near Rogers, and in a former cotton commissary at Pickens and Son Commissary (including a working post office within). Shangri-La Resort in Mt. Ida. Lindsey's Hospitality House in North Little Rock. And then, of course, there are all the amazing places to get pie in Arkansas, from the Shangri-La Resort near Mount Ida to Batten's Bakery in Paragould, the Jenny Lind Country Cafe at Gate Nine, Miss Anna's on Towson (the former Goodson's on Towson) in Fort Smith, and of course Charlotte's Eats and Sweets in Keo. There are the delicious pies from Ms. Lena's in DeVall's Bluff, and the famed Company's Comin' Pie, the pie of the Arkansas sesquicentennial, at the Cliff House Inn near Jasper. And how could anyone overlook the pie buffet at Grandma's House Cafe in Winslow? The Purple Cow in Little Rock. 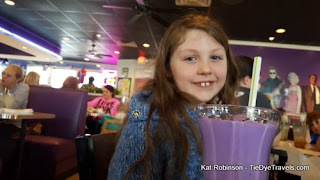 There's even the kid-favorite Purple Cow. 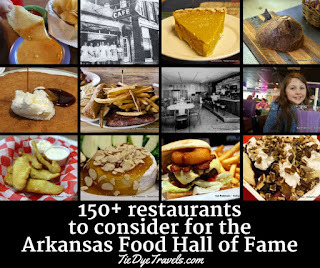 And another 100 or so great classic Arkansas restaurants that have stood the test of time - such as Brave New Restaurant, Olde Tyme Burgers in Texarkana, the Skillet in Mountain Home, Ranch House in Harrison, George's in Fort Smith, William's Barbecue in West Memphis... heavens, off the top of my head I cannot name them all. One more note - while recent favorites such as Big Orange and David's Burgers don't qualify for classic Arkansas restaurant status, their proprietors (Yellow Rocket Concepts and the Bubbus family, respectfully) do qualify for proprietor of the year. Now that you have this information, head to the Arkansas Food Hall of Fame nomination form and vote. Vote early and often and all that jazz. And thank you for helping support Arkansas's restaurants.